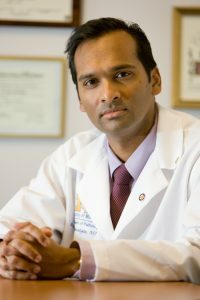 Taubman Scholar and Rogel Cancer Center researcher Arul Chinnaiyan, MD, PhD, has received an Outstanding Investigator Award from the National Cancer Institute, which provides $6.5 million in funding over seven years. The grant will fund research to create new bioinformatics resources and identify new cancer biomarkers to improve diagnosis and ultimately to develop new targeted therapies. The award — roughly three times a traditional individual investigator award — is part of a grant program called R35 developed by the National Cancer Institute. It’s designed to fund projects of unusual potential in cancer research over an extended period of seven years. The goal is to provide established investigators long-term support that gives them flexibility to focus on exceptional and ambitious cancer research programs. As researchers gain more understanding of how to target cancer treatment to specific genetic markers, identifying the best, most “actionable” markers is crucial. This new grant will provide long-term support to increase understanding of these markers to leverage targeted treatments for cancer. “The field of precision oncology continues to evolve with the overarching goal of providing cancer patients with enhanced diagnostic and prognostic capabilities and better treatments. This grant will help us identify new biomarkers and understand their biological roles in cancer progression,” said Chinnaiyan, director of the Michigan Center for Translational Pathology and S.P. Hicks Professor of Pathology at the U-M Medical School. Unlike traditional federal grant funding, the Outstanding Investigator Award does not fund a specific project. Rather, it’s designed to support the very best researchers who have a track record of innovation and success. Chinnaiyan is a national leader in precision oncology. In 2010, he launched the Michigan Oncology Sequencing Program at the Rogel Cancer Center. One of the first and most comprehensive clinical precision oncology efforts in the nation, Mi-ONCOSEQ is a research protocol for sequencing the DNA and RNA of metastatic cancers and normal tissue to identify alterations that could help drive treatment. The program includes a precision medicine tumor board in which experts discuss each case. Mi-ONCOSEQ has enrolled more than 3,000 patients and has yielded multiple publications, expanding the understanding of genetic mutations that drive cancer. Chinnaiyan’s lab has also analyzed the global landscape of a portion of the genome that has not been previously well-explored — long non-coding RNAs. This vast portion of the human genome has been considered the dark matter because so little is known about it. Emerging new evidence suggests that lncRNAs may play a role in cancer and that understanding them better could lead to new potential targets for improving cancer diagnosis, prognosis or treatment. Chinnaiyan’s lab has identified and explored several lncRNAs that could be promising targets for future therapy. The new grant will advance that work. “We want to further characterize the dark matter of the genome. Some of these lncRNAs will certainly be very useful as cancer biomarkers and we think a subset are important in biological processes,” Chinnaiyan said.